My love of Pinot Noir has grown the last few years. Now that I know pinot is more than the watery light tasteless variety usually associated with pinot, thanks to great advertising the public believes these are what pinot should be. 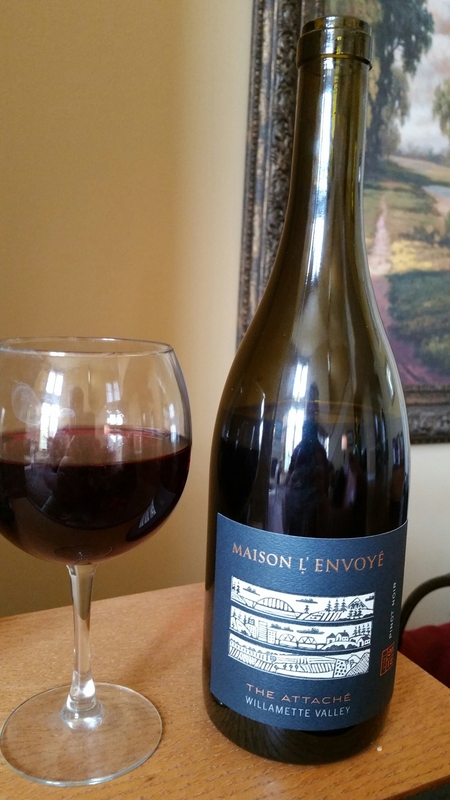 Tonight I give you, Maison L’Envoye. Straight from the Willamette but tasting like the finest from Burgundy. Winemaker Max Marriott has crafted one of the finest pinot with grapes selected from the best vineyards. The bouquet erupts from the bottle with strong notes of violets and roses followed with an earthy mineral and a smokiness. The color , a soft purple, that regal royal color. A beautiful elegance shimmering with glory. I raise the glass in splendid anticipation. My senses are on high alert. The first wave ignites my mouth. Rich tastes of blueberries first tingle my tastebuds. Then a lucious coating of velvet smoothes over my tongue. The flavors just keep coming. The rich berry turns into a full smoky note with hints of earth. Not at all a turnoff, instead it adds more depth and structure. Subtle notes of pepper and spice with just a hint of oak. A very long finish. Your mouth is already begging for more. Oh my my I can’t wait for another bottle.